YOU SHOULD DRINK ONLY PURIFIED WATER! The Anheuser-Busch Brewery put beer production on hold this week, instead canning safe drinking water to distribute to flooding victims affected by Hurricane Harvey. 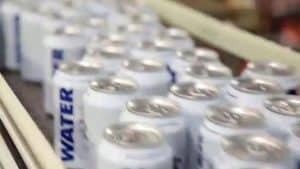 More than 50,000 cans of emergency drinking water will be sent from the brewing company’s factory in Cartersville, Ga., a spokesperson for Anheuser-Busch said to FOX5. The water will be distributed at Red Cross shelters in Baton Rouge, La., where Flash Flood Watch is in effect through Thursday, according to the National Weather Service. “Throughout the year, we periodically pause beer production at our Cartersville, Ga., brewery to produce emergency canned drinking water so we are ready to help out communities across the country in times of crisis,” said Sarah Schilling, brewmaster at the Anheuser-Busch brewery in a statement. “Putting our production and logistics strengths to work by providing safe, clean drinking water is the best way we can help in these situations,” she said. Anheuser-Busch halted beer production to can water during natural disasters before, including during flooding in Louisiana, wildfires in California and Hurricane Mathew.